The Bulls, obviously, are hoping it doesn’t become a Shakespearean tragedy. But the elements are there as Bulls coach Tom Thibodeau said before Saturday’s playoff Game 1 in Brooklyn that Joakim Noah not only could play, but that he may start. “We’re going to let him warm up and if he feels OK, he’s going to go,” Thibodeau said in something of a surprise after all the negative talk about Noah’s plantar fasciitis condition after practice Friday. Of course, the question then is at what price? Shakespeare wrote of noble and likeable but flawed characters. Is Noah’s desire to play back home in New York in the playoffs for the first time outweighing his reason? Could he worsen his condition and be out a longer period? 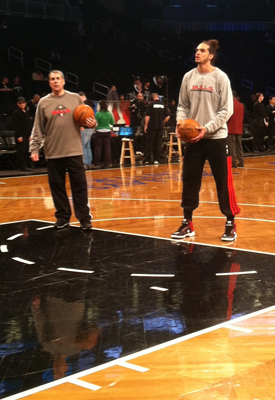 Or will this help and, obviously, the team needs him against All-Star center Brook Lopez. Yes, to play or not to play. That is the question. Is it nobler of the body to suffer or take the slings and arrows of outrageous caution? And, of course, Saturday night live. Thibodeau also indicated it’s likely Derrick Rose will be on the bench more during this series. Thibodeau said previously he had asked Rose and other players not to be on the bench during games as it could prove a distraction to the other players given so many players were hurt. But Thibodeau said now with everyone but Rose back that could change. As for Rose, earlier at team shootaround, Thibodeau acknowledged Rose is “most likely out” for the playoffs. But Thibodeau again refused to say Rose would definitely not play given he could get over a final hurdle to playing at some point. Rose has told the team he still doesn’t feel quite right after his reconstructive knee surgery last April. “I guess there’s always a chance (Rose could play),” Thibodeau reiterated before the game. “He has worked extremely hard. And he wants to be out there very badly. I know I’ve said it often that he’s close and he is. But he can’t quite make that final step. Until he can do that, we have to remain patient. As I mentioned this morning, it’s unlikely that he’ll play. But the way the playoffs are structured, a week from now maybe he makes that final step. I never want to rule that out. But nothing has really changed. “From the start of the season, because of when the injury occurred, we knew he would be out for a good chunk of the season and we knew it would be a long process,” said Thibodeau. “So we went into camp with the understanding that Derrick would handle his rehab and focus on that. “And then the team would focus on daily improvement and their next opponent and hopefully at some point, he would rejoin us. Now, he’s practiced with us and he’s doing everything at practice for quite a while now, since really January, so he’s been around the team. It hasn’t been an issue; it hasn’t been a distraction. We understood going into the season what we were going to have to deal with and we knew going in that no one player was going to replace Derrick and our only chance was to do it collectively, and for the most part, our team’s done a great job with that.